I have a confession: I’m a hanger freak. You know that scene in Mommie Dearest, the classic 1981 film starring Faye Dunaway as a terrifyingly overbearing Joan Crawford, when she goes berserk on her daughter having wire hangers in her closet? (Here it is, in case you have no idea what I’m talking about.) Yeah, that’s me. I hate wire hangers. I loathe them—nay, I despise them with every fibre of my being. It borders on an actual phobia. When I’m in the presence of a wire hanger (like when I pick up my dry-cleaning, or perhaps while shopping), I recoil as a vampire does from the harsh rays of the morning sun. I wasn’t always this way, though. It took me a while to figure out that a single wire hanger—and, even worse, a multitude of them—can actually have a very negative impact on your life. Here’s my tale. Growing up in small-town Alabama, my family never wanted for anything—we certainly weren’t rich, but we weren’t poor. Still, I didn’t exactly have access to the how-to’s of living a slightly elevated life, even on a budget—fashion magazines were really my only portal to a fancier life, and they could only offer so much. (Yes, this was before the days of the Internet—gasp!) So, my family only ever used wire hangers. Until I moved out on my own at college, I never knew of a life other than one that prominently featured wire hangers. I spent what probably adds up to hours of my life dealing with the nuisances—untangling them, hearing them clank mercilessly against each other as I shuffled through my closet, being stabbed by their cruel, unruly edges. Then, slowly but surely, I discovered a whole new world, full of other kinds of hangers, made from everything but wire—and my life forever changed. Plain and simple: Hangers have the power to improve your sartorial life. They also have the power to make you dread the very act of getting ready in the morning. It’s up to you to decide which way your closet leans—in the positive direction, or the negative. 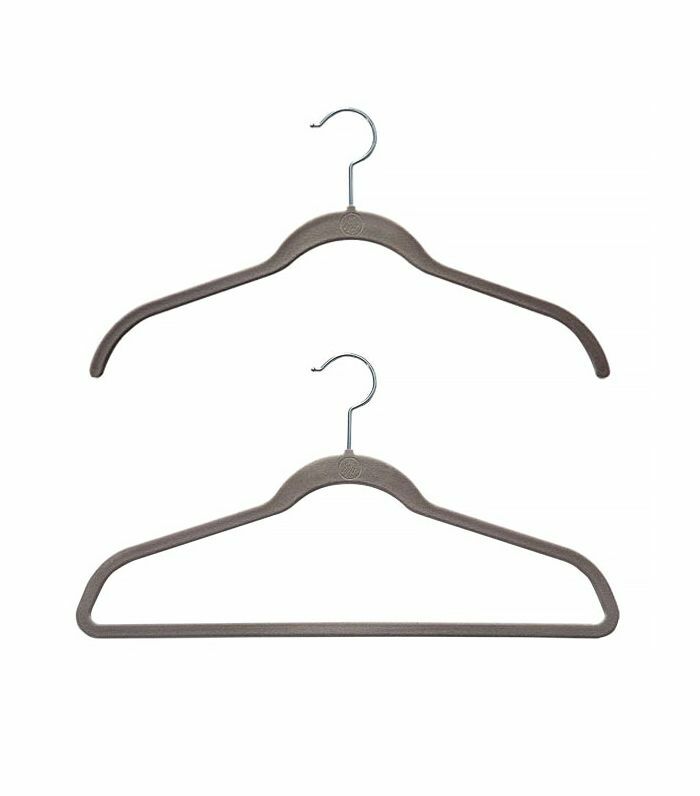 Do your hangers impale your clothes (wire), or do they hold them respectfully and without injury? Do your hangers constantly tangle in mind-boggling ways (wire), or are they perfectly lined up and organised in ways that make you happy? The decision is yours. But in my humble opinion, if you have wire hangers in your closet, you should hop to it right now, pull them all out, and toss them (or take them back to your drycleaner). Trust me, your life—or at least the life of your clothes—will improve almost instantly. Keep scrolling to see (and shop) some of my favourite non-wire hangers now! Do YOU think your hangers have a significant impact on your life? Tell us in the comments below! And keep reading to find out more common mistakes professional closet organisers always see.